Breakfast is served, 7:30 AM and 9:00 AM, in the Brick Room. 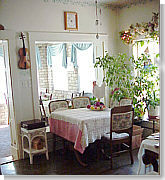 This cozy dining room looks out over the flower and herb garden. 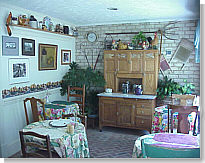 Tasteful decorations, Bobs photographs, Joan's collected tea pots and chickens, a beautiful fire place and charming window treatment, are all ingredients of a fine dining experience. Made with thick bakery bread.